Urbanite Angelenos, rejoice. Especially if you have that little patch of soil in that planter outside your door or are even fortunate enough to live in a building or a house with a dedicated garden. It’s time to get out that green thumb (or grow one) and attend one or both of Cube LA‘s garden classes downtown. The next installment is on Saturday, August 14th, 2010. Get ready for your fall vegetable garden – and remember to invite me to your October dinner party so I can test the fruits (vegetables) of your labor. And if you fix me a cocktail with a garnish from your herb garden, that counts, too. Further incentive to attend will be provided byÂ Chef Ludo Lefebvre andÂ The Ludo Bites Fried Chicken Truck and Coolhaus with their delicious ice cream sandwiches. You didn’t think they’d let you go hungry, did you? This class will introduce strategies for year-round food production for Southern California gardeners. Cool season gardens can provide a bounty of fresh produce. August is a great time for planning fall gardens and to start planting seeds for broccoli, cauliflower, root vegetables and a variety of delicious leafy greens. 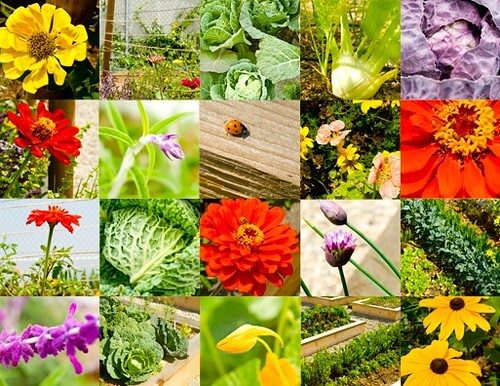 This class will cover the basics of planting seeds and seedlings, choosing appropriate varieties to plant, understanding day length and temperature and how they affect the growth of your fall garden. This class will offer fresh ideas for ways to use herbs from your garden. We will make use of common garden herbs such as rosemary, sage, lemon verbena, mint, etc. and use them to make flavored salts, herbal vinegar, butter, tea and several bath and beauty products. Participants will get to sample a variety of herbal products and get to take home an item that they make in class. Recipes will be provided.